1. The District Educational Officer & Ex-Officio District Project Officer of SSA shall notify that all these posts shall be engaged purely on temporary and contract basis for the period indicated in the letter by the concerned authorities. 2. A press note may be issued in local News Papers in the District indicating names of the Mandals /schools (KGBVs/URS) and number of vacancies and also to display the Notification in the District Offices O/o DEO & EO-DPO SSA and the offices of the MEOs. The application forms shall be made available to thecandidates at the DPOs. Age Limit: Minimum 18 years & Maximum 44* years. The age is reckoned as on 01/07/2017 (5 years relaxation for SC/ST/BC and 10 years for PHC). 4. District as a unit of appointment for all the posts. (ii) The Rule of reservation and Presidential orders shall be followed while engaging the field level persons.6. Scheme of Examination: The selection of candidates for engaging to the posts will be made by written test (online I of:fline). 7. Honorarum: A fixed amount will be paid as monthly honorarium for concerned post as per the orders of State Project Director, Sarva Shiksha Abhiyan. 8. The candidates shall enter into a contract agreement with DEO / MEO / SMCs to work till the end of the academic year subject to review of her / his performance on Academic / Administration / Technical aspects etc., on monthly basis. 9. The vacancies shall be filled on priority basis. 10. The vacancies arised time to time shall be filled with the candidates available in the merit list. Identify the vacancies post-wise and issue notification on priority basis. The Committee consisting with the following officials may be constituted for selection of candidates. 1. Maintenance of all types of Mandal level statistical data including planning and DISE Maintenance of Web portal data. 3. Monitoring the status of working condition of computers in schools. 4. Any work assigned by MandaI Education Officer. 5. Analysis of DISE and other data. Candidates shall apply only in the prescribed Application Form available at DEO & EO DPOs of SSA. Photo copies of the following certificates, duly attested by the individual, shall be enclosed to the application. • Marks memorandum of SSC (proof for date of birth). • Marks memorandum of Board of Intermediate Education. • Marks memorandum of Degree. • For Local Candidature proof they should submit Study Certificates from 4th to 10th Class. • Candidates shall affix her/ his recent photo and shall sign on the photo . • Disability certificate issued by the SADARAM as per Government norms . 13. At the time of posting, all the relevant original certificates as mentioned above along with nativity proof should be verified. & EX-OFFICIO STATE PROJECT DIRECTOR, SARVA SHIKSHA ABHIYAN, TELANGANA STATE, HYDERABAD. 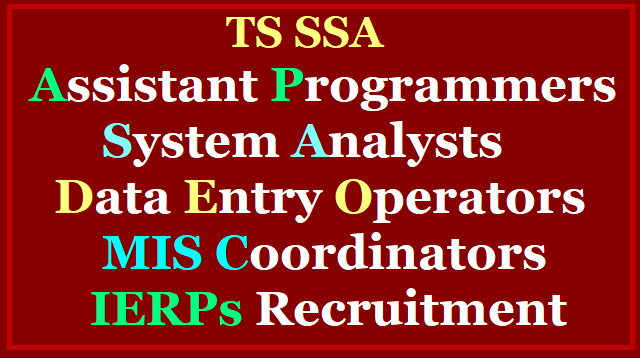 Sub:- TSSA, Hyderabad - Planning & MIS - Issue of notification - Filling up of posts of field level functionaries in SSA - Further Instructions -Reg. Read:- This office Proc.Rc.No.3480/TSSA/Plg/T? /2017, dated:27 /09/2017. SARVA SHIKSHA ABHIYAN TELANGANA, HYDERABAD. Address for correspondence with : Contact No. The candidate shall bring all the relevant original certificates as mentioned above for verification purpose. Declaration I hereby declare that the above information furnished by me is true to the best of my knowledge. If any information is found incorrect, my application may be rejected.